What is a Marriage-based Green Card? A marriage-based green card is when an immigrant obtains permanent residency because of their relationship to a U.S. citizen or permanent resident spouse. A marriage-based green card is when an immigrant obtains permanent residency because of their relationship to a U.S. citizen or permanent resident spouse. Thousands of immigrant obtain permanent residency based on a marriage relationship each year. You may also be eligible to obtain a green card based on your marriage. Your green card may be conditional for two years if you haven’t been married for a long time. You will be able to apply to remove the conditions after the two years are up. This conditional residency process is in place to prevent sham marriages, or marriages that are entered into for the sole purpose of taking advantage of immigration law. The first step requires your U.S. citizen or permanent resident spouse to file Form I-130, Petition for Alien Relative, on your behalf. Once your petition has been approved, the next step depends on whether you are married to a permanent resident or a U.S. citizen. If you are married to a permanent resident, you will have to wait in line until a visa number becomes available. This is because there is an annual limit on the number of green cards the USCIS can issue to people in your category (spouses of permanent residents). Your place in line is determined by your Priority Date (the date your spouse filed your I-130 petition). When your Priority Date becomes current, you will be able submit your green card application. If you are married to a U.S. citizen, you do not have to wait for a visa number to become available. A visa is available for you as soon as your petition is approved. 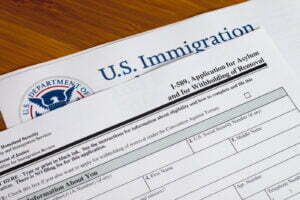 You may file your green card application immediately after approval. If you are living inside the U.S. with lawful status, you may be eligible to adjust status. Adjusting status means you may apply for your green card while in the United States with Form I-485, Application to Register Permanent Residence or Adjust Status. If you are living outside the U.S., or if you are living inside the U.S. but are not eligible to adjust status, you will need to work with the National Visa Center (NVC) and the U.S. consulate or embassy in your country to arrange an interview to assess your eligibility for an immigrant visa and a green card. If you are inadmissible to the U.S., due to unlawful presence for example, you may also be eligible for an immigration waiver based on your relationship that may help you overcome any barriers to getting your green card.